Posted by Kim May on March 7, 2018 under #IBMInsight, DB2 Education, Frank Fillmore, IBM Think Conference, Information on Demand Conference, Insight 2014, Insight 2015, TFG Blog. Frank asked me to respond to an email from an IBM’er asking whether we will be at the Think Conference in Las Vegas. I started the reply and then decided – in the interest of efficiency – to post my response on our blog so that I can direct inquiries here. Apparently there’s a bit of pressure on to boost attendance. After attending every IOD, Insight and World of Watson conference, Frank and I have decided to skip Think. The arc of the annual IBM data-centric conferences has in many ways paralleled the arc of The Fillmore Group over the past 10 years. I haven’t given up on achieving success in the future, but the status quo is unsettling. Some history: when IBM announced the first Information on Demand/IOD Conference, I was fairly new to The Fillmore Group. I sold and coordinated technical training for companies in the Mid-Atlantic prior to joining TFG and was involved in the Greater Baltimore Tech Council, whose quarterly wine tastings were legendary – fun, great for business, and fabulous networking. Frank loved the idea, and we hosted our first wine tasting at the first IOD annual conference in Anaheim. At this event I was introduced to the IBM Lab Services Data Management team, who became our largest customer for the next three years. After the first year the conference was moved to Las Vegas, where each year we have rented a suite and hosted a champagne tasting. 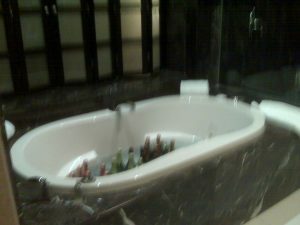 One year we couldn’t get a large enough suite and had to put the champagne in the bathtub (see the picture below – only in Vegas!) I recall that year particularly vividly as Frank gushed afterward at the number of IBM Data Management VP’s in attendance (6 – and my guess is he can still name them!) We had a great time introducing IBM’ers to their colleagues and wow’ing our customers by introducing them to the stars of the Db2 world. At one of the conferences Steve Mills attended our event as well as the IBM Data Champions luncheon where he gave Frank an award for our consulting team’s support of the JP Morgan Chase Oracle to Db2 migration effort. Frank is rarely speechless; on this occasion he was. So why aren’t we looking forward to another conference? First, we want to be where our customers are. I am the chairman of the Baltimore/Washington Db2 Users Group and I only know of one of my member organizations sending people to Think. We have a lot of Federal agency members, and they stopped attending years ago, but even the commercial customers don’t seem to be interested. I believe the Db2 technical people, if attending any conference at all in 2018, will be at IDUG. The IDUG session abstracts explain what will be presented in a font that allows for the use of multiple words, and the topics are of interest to the audience. I understand a few will be at SHARE next week…along with most of the IBM z technical team. Who can afford 3 weeks out of the field attending conferences before the end of the first half? Second, IBM’s often contradictory messaging regarding the role of Business Partners is particularly confusing this year. What is the value of this partnership and what do partners provide to IBM and its customers? What is IBM doing to support us in return? In the past there was recognition for our product promotion and outreach. For these efforts, primarily related to marketing and reselling IBM software, partners like The Fillmore Group were provided with sales leads and co-marketing funding to offset event costs. Over the past year IBM has “transformed” the Business Partner program. They claim the new program recognizes skilled partners, and claim partners will be allocated sales leads and co-marketing funding based on the achievement of technical competencies. Competencies – according to IBM – are determined by the certifications earned in a particular category, demonstrating technical skills, and reselling a minimum of one million dollars’ worth of software in each category. I giggle as I type. Our team has historically supported customers running IBM replication solutions. Has anyone paid (channeling Mike Myers’ Austin Powers as Dr. Evil) ONE MILLION DOLLARS for replication? Meanwhile IBM is trying to transform (oh that word!) their software licensing to a cloud-based, SaaS model, and encouraging Business Partners to develop the ability to collect monthly software license fees from customers. Will the new partners ever achieve the one million dollars of sales within one Analytics sub-category and qualify as “competent”? If not, will the top partners grow IBM’s software business or simply continue to slow revenue slide along with IBM? On the 2018 IBM Business Partner kickoff call, IBM’s General Manager for Global Business Partners listed his 5 top initiatives for 2018. One is to better support IBM’s top 300 resellers, of which The Fillmore Group is not one, and another is to attract new Business Partners. IBM has 19,000 Business Partners. As one of the 18,700 IBM Business Partners IBM has abandoned, we plan to attend IDUG with some technical folks and customers and hope maybe someday IBM finds us of value again in the future. IDUG North America 2015 – Heading East to Philadelphia! Posted by Kim May on November 21, 2014 under DB2 Education, DB2 for Linux Unix Windows, DB2 for z/OS, Insight 2014, International DB2 Users Group (IDUG). Tags: IDUG. The International DB2 Users Group (IDUG) has announced the 2015 North America Conference will be held in Philadelphia May 4-8, 2015. As the conference has been held west of the Mississippi for the past few years, we are excited about having a “local” conference for the DB2 community in the East. The Conference Planning Committee has begun efforts to invite DB2 users to attend. Having just returned from the IDUG Europe Conference, and shortly before having attended Insight, the two events are quite different. While Insight has a vast array of events and something for everyone (and a lot of everyone’s!) the IDUG Conferences are smaller, more focused on DB2, and definitely are the better events for technical networking and getting to know the DB2 community. If you are making plans for 2015, please consider attending. Information on the conference is available at www.idug.org. And remember, although there is a fee to attend the conference, IDUG membership is free! Posted by Kim May on October 24, 2014 under Baltimore Washington DB2 Users Group, DB2 Education, IBM Champion, Insight 2014. I am all packed and ready to head west tomorrow morning to the IBM Insight Conference in Las Vegas, along with THOUSANDS of DB2 users! It should be an exciting week, with lots of great sessions. I am particularly looking forward to seeing IBM’s Jim Reed to thank him for getting IBM Distinguished Engineer Haakon Roberts to come present to the Baltimore/Washington DB2 Users Group meeting December 11th – details will be at www.bwdb2ug.org the week after next. Jim is working closely with the IDUG Conference Planning Committee, who will host the 2015 North America IDUG Conference in Philadelphia, a short drive for our members. Thank you! I will miss seeing the Information Champion’s program “champion” Beth Flood, who isn’t able to join us this year. We’ll miss you Beth! I hope I will see you in Vegas! Posted by Kim May on October 9, 2014 under DB2 Education, DB2 for Linux Unix Windows, DB2 Migrations, Frank Fillmore, IBM Information Management Software Sales, Insight 2014, Oracle, pureScale, TFG Blog. Tags: DB2, Oracle to DB2 Migration. Excuse the corny wordplay – please! IBM will again host the annual Break Free Forum (BFF) at the upcoming Insight Conference in Las Vegas (previously known as the Information on Demand Conference). In addition to many terrific conference sessions, speakers and entertainment, the Break Free Forum is a 2-hour session dedicated to customers considering, and hopefully moving to, DB2. Frank has been invited to participate on the panel at the Break Free Forum, which is quite an honor. And, as Frank and I have had the pleasure to work with many of the talented IBM teams that support customers moving to DB2, we will be there with several BFF’s – including Amit Patel, Bill Kincaid and this year’s Break Free Forum host Paul Zikopoulos. If you are planning to attend the Insight Conference and are interested in joining us at the Break Free Forum, please let me know. I believe the session is invitation-only, but I am sure coordinator Angie Payton would be happy to send you an invitiation. Posted by Kim May on September 9, 2014 under DB2 Education, DB2 for z/OS, DB2 Gold Consultants, Frank Fillmore, IBM Champion, IDAA, Insight 2014, TFG Blog. Tags: DB2 Consulting, DB2 Education, DB2 for z/OS, IDAA, Insight 2014, z/OS. Frank Fillmore will be delivering a session on IDAA use cases at the IBM Insight Conference in Las Vegas (formerly IOD) on Tuesday, October 28th, from 10am-11am. The IBM DB2 Analytics Accelerator (IDAA) speeds analytic queries that currently run on DB2 for z/OS. Help with operational data store reconsolidation on IBM System z. Reduce extract, transform and load (ETL) costs and latency to make OLTP data available for analysis faster and less expensively. Speed up batch reporting and offload System z processor consumption. Archive original data by using the high performance storage saver (HPSS). Enable analysis of VSAM and Information Management System (IMS) data along with DB2 for z/OS by using the DB2 Analytics Accelerator Loader. In Frank’s session, attendees will learn about these functions and more, and gain an understanding of possible, interesting, and valuable IDAA use cases. I hope we will see you there!